have a look at this cologne ad i shot. That is a very strange video! However, I am "diggin" all of those fake mustaches! Welcome, Marla. Great review of this gorgeous scent. I have a bottle of the parfum, with its snakes and charm and I absolutely love it. I don't know how it smelled when it was fresh, but the vintage juice is, indeed, great. The only thing stopping me from wearing it more often is the hoarding instinct. I'm scared of running out and being unable to replace it. Thanks for reviewing one of my old favorites! 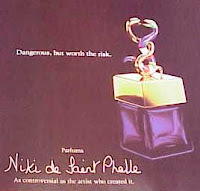 It is really a shame that this one is not around anymore - not to mention Niki herself, who was a truly creative person. I always got the tagetes from this, I wonder what it's like in the older stuff, with the florals fading out. This was probably the first "edgy" fragrance I ever liked, and it led me to appreciate other unusual perfumes as well. To my great surprise I found the EdT of Niki sitting on a shelf in a chain perfumery in Germany - at a very reasonable price, too! Not the perfume, which I crave (that bottle! WANT! ), but great for the occasional fix of - on me - lightly sweetened pine needles. It makes me feel like "my own woman", free to be what and who I want and independent of other people's opinion. Welcome, Marla! This one works for me in EDT/parfum, any concentration. It's definitely weird and wonderful! Unfortunately NdSP is...don't know how to put it...a scent that is bigger than me :-) It wears me instead of the other way round. But it is so gorgeous. Love it AND hate it. It's so very, very weird. I can't even imagine a house releasing something like that today. I wore it awhile in the 80s and wound up with a bottle recently. I think I've decided it's a bit much on my skin; the way I love it best is walking into my perfume closet six hours later with the smell in the air. Thanks for the review! A wonderful review- I have to admit that I didn't appreciate this one when it came out. I thought it was too weird. I'll have to see how I like it two decades later, when my definition of wierd has narrowed.. Welcome Marla, what a wonderful review! I am absolutely entranced by the work of NdSF, her sculpture garden in San Diego is one of most beautiful and enchanting installations that I've ever seen. She was an amazing talent who died way too young. Alas, I've never tried the perfume, but now I am obsessed with finding some. It sounds like a very unique fragrance that I would adore! Are they still making this perfume? I see a lot of it for sale at many different perfume shops online. Is it new or from the 80's? Yes! They're still making it! What a great review! And thanks for the welcome news that Niki's still being made. I've been wearing it since 1996. Nice to find my perfume pack. I stumbled on to it in Miami in a perfume shop in the basement of the Amerifirst building. I tried on a different perfume every day, and, six months later...voila. I told the elderly woman behind the counter I wanted to buy it (I'm sure she'd given up all hope of me every turning into an actual customer), and she refused to sell it to me. "This perfume is too old and dark for you. It's supposed to be an aphrodisiac. Try this instead." And proceeded to squirt me with Escada. I insisted on buying the the little blue bottle. She still refused. "Come in every day, put it on for a week, and if you still want it, I'll sell it to you. But it will bring strange things into your life, I think." I did so, and, at the end of a week, she reluctantly sold me the bottle. She only charged me $10! I was working in Chicago in a sports bar in the 80's selling merchandise upfront and one evening a women came in and smelled so wonderful and mysterious. I had to know what it was. So I asked her and she said " It's Niki de Saint Phalle and it's very expensive." So I said "Oh really?". The next day me and my Neiman Marcus card went shopping for NdSP. And the rest is history. I wear it during the day and evening, but in the evening it makes me feel so naughty! Very lusty... you know. Like I have this secret that I'll never tell. There's only a few special people that have walked this earth and have left their mark. NdSP is one of them. Thank you for putting me in touch with a source in Miami - it means a great deal to me as I miss this scent very much. I used it in my late 20s and hopefully again. Loved the Niki de Saint Phalle!! I saved my little 3 oz bottle with the snakes on it BUT mine came with a snake bracelet!! I remember, and so does my mother, it was a promotion being done but we cannot find ANYTHING on the internet showing this bracelet with a promo with that perfume but it came as a gift set....any clues? I have if for sale on my Etsy page, www.ravyns09.etsy.com but have been curious about that promotion with that bracelet for years!!! You would think I would be able to find it by now! I can be reached on my Etsy page, would love to know what you think!! This was the most glorious scent. I'd give anything to have it recreated. The scent was so unusual and beautiful--just remembering it takes me back to a very happy time in my life. A very dear man I knew, back in the day, loved it. It's amazing how a perfume can intensify feelings as well as bring back so many memories. I was really happy to hear that it's still around--I actually found it on Amazon for about 32.00. I wonder how it's changed. I just splashed a bit on after not wearing it for 20 years. It is a heady, rich, deep scent, heavy on wood and vetiver notes. It has aged gorgeously. Thanks for the wonderful review. I really love this fragrance. I bought some years ago used it up and ordered more over he internet. Today I wore it and two men told me they thought I smelled great. So fresh! When I first encountered this perfume, I fell in love with it (like you, I fell in love with the artist's work first). It is the only scent that I have worn for over 25 years - everyone I've ever dated (male and female) has loved it as much as I have. It has depth and you are right - very unique.